Explain the impact of recent Taiwan election outcomes on domestic politics. The big issues in the election were economic growth; wages and employment; pension reform; transitional justice; and energy issues, along with a host of local issues. Action concerning most of these issues are the responsibility of the national legislature, where the DPP [Democratic Progressive Party] still enjoys a comfortable majority. Expect the DPP to continue its policies at the national level. However, Taiwan’s 9-in-1 elections concentrate on the local governance, and their results will impact issues of local concern. Expect a shift in local politics where the KMT [Kuomintang, or Nationalist Party] won, especially in the politically important cities of Kaohsiung and Taichung. Residents of both cities grumbled about worsening air pollution, stalled economies, and sagging wages. In a move calculated to boost Kaohsiung’s economy, China has already agreed to resume tour groups to the city following the election of Beijing’s preferred candidate, the KMT’s Han Kuo-yu, as mayor. 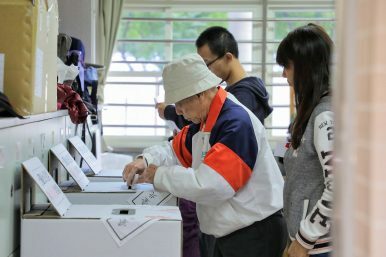 Losing both Kaohsiung and Taichung will make a DPP victory in the 2020 presidential elections difficult as the party will fight an uphill battle against a KMT party machine that has gained control of two key DPP strongholds. How does China benefit from the defeat of the Democratic Progressive Party (DPP)? Beijing should hold off on a victory dance. In these local elections, Taiwan voters evaluated local policies. The elections were less a referendum on Tsai’s China policy, just as China policy played a smaller role than local issues in the 2014 local and 2016 presidential elections. If Beijing misreads the results it may come away with the impression that intimidation, and possibly disinformation and fake news, work to its advantage. That would be unfortunate for Taiwan, because Beijing would then likely carry out more of the same. But Beijing would likely hold off on more intimidation because it is not necessary against a wounded foe. Beijing would be smarter to wait it out until a likely KMT return in 2020. There is a caveat, however. Although the KMT is more willing than the DPP to engage Beijing, most Taiwanese have not changed their dislike of China in this election cycle. There is no guarantee that, as times and sentiment changes in Taiwan, the people of Taiwan will support a return to mainland engagement to the extent that existed under Ma Ying-jeou. Assess the prospects and pitfalls of a Kuomintang victory in the 2020 presidential elections. The DPP is not likely to back away from its base nor make drastic policy changes at this point, regardless of the local election results. If the apparent discontent with the DPP continues, it is likely that the KMT will regain control of the legislature and presidency in 2020. A peaceful transition of government will further solidify Taiwan as a democracy. Taiwan has raucous, hotly contested elections, indicating that the Taiwan people are politically engaged and eager to let their government know when they are displeased. Beijing can criticize it as chaos, but it cannot deny that Taiwan’s elections are democracy in action. If the KMT wins in 2020, expect a resumption of cross-strait dialogue after the KMT reaffirms the 1992 Consensus; enhanced economic benefits as Chinese tour groups return to the island; and return to a diplomatic truce. However, Beijing may wade deeper into Taiwan politics if it concludes that “sharp power” tactics, such as those allegedly used in the Taiwan elections, reap benefits. Specifically, Beijing might enhance underhanded support of KMT candidates and use social media to divide Taiwan society. What is the impact of the DPP’s defeat on U.S.-Taiwan relations? Expect Taiwan to continue to enjoy support both in the White House and Congress. During a time of deep division between congressional Republicans and Democrats, the 115th Congress passed bipartisan legislation supportive of Taiwan, such as passage of the Taiwan Travel Act, inclusion of Taiwan in the 2019 Defense Authorization, and introduction of the Taiwan Defense Assessment Commission Act of 2018. Expect the White House and 116th Congress to be similarly supportive. U.S. Vice President Mike Pence has assured Taiwan that Washington will continue to uphold the Taiwan Relations Act. In fact, China’s increasing intimidation of Taiwan may be giving Congress more ammunition to call for increased arms sales to Taiwan. Expect the U.S. Senate Foreign Affairs Committee chairman James Risch, already active on China and Taiwan, to keenly follow developments on Taiwan. Similarly, expect the new House Foreign Affairs Committee Chairman Eliot Engel to hold more hearings on China to rebalance congressional oversight away from the Middle East and Iran and toward Asia. At the forefront of these hearings will be U.S. concerns on Taiwan’s security and China’s use of “sharp power” to undermine democracies like Taiwan. As a flashpoint issue in U.S. China policy, explain how Taiwan’s political future could transform U.S.-China relations. The elections results introduce a high degree of uncertainty into U.S.-China relations. U.S. policy toward Taiwan has always required Washington to triangulate between Beijing and Taipei. The DPP’s defeat makes it more difficult for Washington to formulate Taiwan policy knowing that Tsai may be gone in less than two years, and that her government appears wounded in China’s eyes.